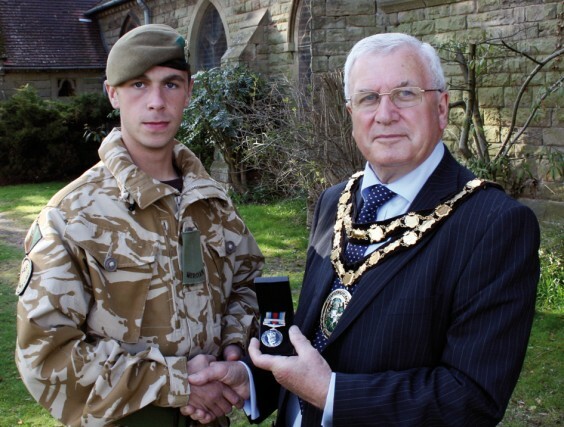 The Bromsgrove teenager’s bravery was recognised in a civic reception at the district council where the citation telling of his bravery was read by Major Bob Prophet, of the 2nd Battalion Mercian Regiment (Worcesters and Foresters), which we print below. After the citation was read, Private Kennedy requested a minute’s silence for casualties, including another Bromsgrove soldier, Private Robbie Laws. “On 8th June 2009, Pte Kennedy was involved in the A Company 2 MERCIAN (attached to the Light Dragoons Battlegroup) deliberate operation, Op Kapcha Khatamso, to clear the north eastern area of the Battlegroup South area. The operation was conceived to provide breathing space for the forthcoming Relief in Place with the United States Marine Corps Battalions, 2/8 and 1/5. They were to use route 605 as a main supply route and, therefore, it was vital that the route be free of enemy and Improvised Explosive Devices. The operation consisted of a slow, deliberate clearance of the route from south to north over two days. On the evening of the first day, Pte Kennedy’s multiple patrol was engaged from the front at a range of approximately 600 metres. During this engagement, Pte Kennedy displayed extreme professionalism and courage, suppressing the enemy fire whilst assisting his Platoon Commander as his battle partner. It was during the next morning’s contact, however, that Pte Kennedy’s actions were worthy of public recognition. Having consolidated in the village of Gholam Alikhan Kalay overnight, Kennedy’s multiple patrol was tasked to advance across open ground under cover of Combat Reconnaissance Vehicles (Tracked) (CVR(T)). From the Line of Departure, the patrol moved towards the previous night’s firing point, finding a suspected enemy position along the way. They entered a compound, reorganised for a few minutes and then continued to push north into the open ground. At this stage, the CVR(T) were slightly to the right rear by 300m, trying to cross a small stream and out of sight. It was then that the multiple came under ferocious small arms fire from at least three firing points; it later became apparent that there were at least nine enemy in the ambush. The fire was coming from as little as 150 metres away. The multiple commander, Lieutenant Andy Bell, dropped to the floor, shot through both legs. Realising that the rest of the multiple was in the open ground and that there was no way to extract them without effective fire support, Pte Kennedy immediately crawled to Bell and administered first aid. Still under increasingly accurate fire, and knowing that the enemy were deliberately firing at anyone carrying a radio, Kennedy donned the platoon commander’s radio and sent an accurate situation report. This allowed the CVR(T) to move forward and provide covering fire. However, until this fire came to bear, the rest of the multiple was still pinned down in the open. Kennedy crawled back to a fire position and started to engage the enemy with accurate, controlled bursts from his Light Machine Gun (LMG). The enemy switched their fire to him and the handle of Kennedy’s LMG was shot away, the round ricocheting on to his helmet and shattering his goggles strapped to the helmet front. Despite this, Kennedy identified the enemy firing point and engaged it. His accurate fire suppressed the enemy and allowed Bell to be extracted and the rest of the section to move into better cover. By this time, the CVR(T) had moved up and started to provide withering fire on to the enemy, allowing the multiple patrol to extract from the killing area. By sending an accurate situation report whilst under fire, Kennedy enabled the casualty to be extracted at speed; by suppressing the enemy with accurate LMG fire, Kennedy enabled the rest of the multiple to extract from the killing area. Had this not happened, the multiple would have taken many more casualties. All this was done by a Private soldier with six months’ experience in the Army.